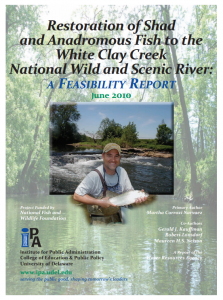 In 2010 IPA’s Water Resources Agency (WRA) assessed the feasibility of restoring fish passage and habitat to the National Wild and Scenic White Clay Creek. This assessment project was funded by the National Fish and Wildlife Foundation, served as an expansion of the Brandywine Conservancy’s Brandywine Creek Shad Restoration effort, and was conducted in partnership with the Christina Basin Clean Water Partnership restoration efforts. Dam No. 1 on the White Clay Creek is the subject of the current phase of this project. Removing Dam No. 1 will be the first dam-removal project in Delaware and will open 4.8 miles of fish passage in the White Clay Creek. Dam No. 1 is a breached dam, 3–8 feet in height, and approximately 100 feet wide. It is composed of timber and stone and located at river mile 4.1 on the property of Delaware Park. In 2010 the Delaware Department of Natural Resources & Environmental Control conducted two anadromous fish–sampling events on the lower White Clay Creek. The catch per unit effort (CPUE) was approximately 500 below Dam No. 1, indicating that there is a significant fish population obstructed by Dam No. 1. The cultural surveys conducted by the University of Delaware’s Center for Historic Architecture and Design show that Dam No. 1 is a historic 18th century dam; therefore, portions thereof will be preserved intact with a public education display serving to re-tell the dam’s historic past. Current fish passage–restoration plans now include a partial notch in the dam in order to restore fish passage and also to preserve the historic nature of the dam. After removing Dam No. 1, the next phase of this project will take a systematic look at the subsequent dams on the White Clay Creek. This process will access the historic and hydrologic impacts of removing each dam. Once these aspects of each dam are fully understood, WRA will work to address fish passage at each site accordingly. For more information about the White Clay Creek project, contact Gerald Kauffman (302-831-4929) or Martha Corrozi Narvaez (302-831-4931).